In the ninth pAsuram, AzhwAr says “For emperumAn to come and unite with me in this manner, there is no reason other than his mercy”. aRiyEn maRRu aruL – I don’t know any other favour of his. ennai ALum pirAnAr – The benefactor who accepts my service. veRidhE aruL seyvar – Will shower his nirhEthuka krupai (causeless mercy). 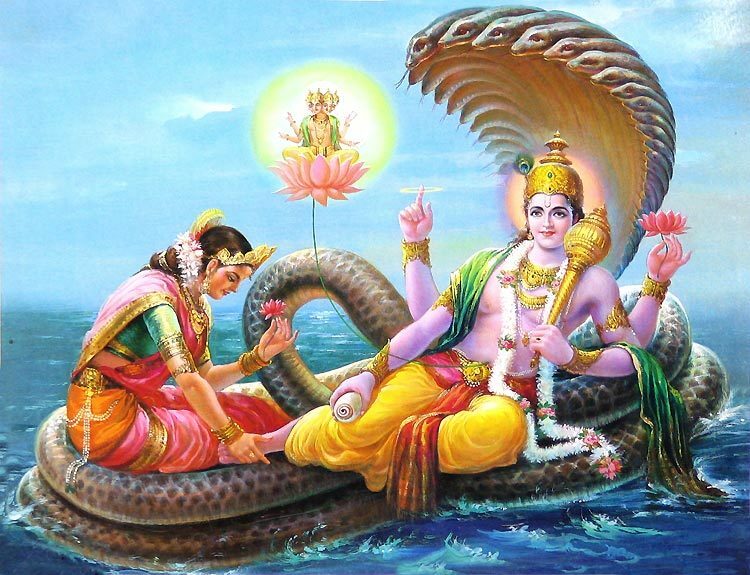 seyvArgatku – To those he considered to pursue as said in kata upanishath 1.2.23 “yamEvaisha vruNuthE” (one who is desired by the supreme lord). If he only helps those who put in some effort, then AzhwAr would not have said “veRidhE” (causelessly). But should there not be some reason for this mercy? (His) Happiness is the reason; it is said in SrI bhAshyam “priya thama Eva hi varaNIyO bhavathi” (Isn’t the one who is desired by emperumAn, pursued by emperumAn?) Even when a chEthana has ruchi (taste/intent) towards bhagavAn, that is only considered as a distinguished nature of the sentient being and not considered as means for the goal. siRiyEnudaich chindhaiyuL – I am so lowly; still I see him in my heart. mU ulagum … – An owner will care for his possessions due to the relationship (owner – owned). One who properly cares for his belongings, remained in my heart and interacted with me improperly. Due to considering himself as lowly, AzhwAr considers emperumAn‘s interactions with him to be improper. emperumAn considers AzhwAr to be greater than the three worlds; AzhwAr considers himself to be lower than the three worlds. This entry was posted in thiruvAimozhi, thiruvAimozhi 8th centum on April 19, 2019 by Sarathy Thothathri. In the seventh pAsuram, AzhwAr becomes very pleased on enjoying the beautiful smile of emperumAn which occurred after emperumAn‘s union with AzhwAr. The radiance of every limb of emperumAn‘s such as reddish mouth, reddish divine navel, whitish divine teeth, radiant divine ear rings, competing with each other, surrounded me; I cannot think of any form other than the manner in which such emperumAn is present with the smile in his reddish divine lips. sevvAy … – Along with the reddish divine lips, divine navel, whitish divine teeth, radiant divine ear rings. evvAych chudarum – The radiance of every other limb. vAy – place. thammil mun vaLAyk koLLa – Each one of them highlighting itself, competing with each other, surrounded me saying “I, I”. Implies each one of them highlighting itself and surrounding me. Alternative explanation – each one of them competes with me and is surrounding me. sevvAy muRuvalOdu enadhu uLLaththirundha – The entity who is explained in chAndhOgya upanishath 3.14 ‘avAkyanAdhara:’ (does not speak, ignores [in paramapadham]), is similing here highlighting that attaining AzhwAr is for his benefit. As a flower blossoms, freshness will be seen all over the flower; similarly he smiled to have an impact in all of his limbs [to become reddish]. avvAy anRi – Other than this place. Other than this smiling form. In SrI rAmAyaNam AraNya kANdam 63.12, first the nature of sIthAp pirAtti is said as “kAnthasmithA” (one who has a gentle smile) and was then said as “jAthahAsA” (smiling) to differentiate the change in her state after becoming joyful at that time. I don’t know about any other mercy of his. Implies, AzhwAr is satisfied with this and does not need anything else. This entry was posted in thiruvAimozhi, thiruvAimozhi 8th centum on April 18, 2019 by Sarathy Thothathri. In the sixth pAsuram, AzhwAr says “emperumAn gave himself to me due to his great desire towards me and not because there would be no one to enjoy him, who has greatly distinguished beauty, if he gave me some other benefit”. tharumEl pinnai yArkku avan thannaik kodukkum? kodukkum – will he give? 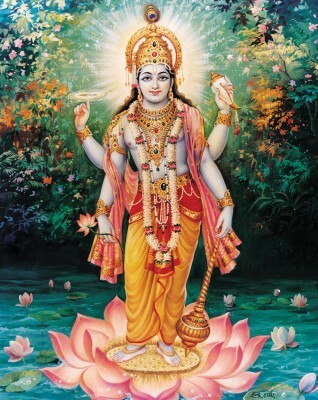 emperumAn resembles a dark carbuncle hill with a reddish/freshly blossomed lotus flower bush, with his divine chest, divine feet, divine eyes, divine hands, reddish divine lips and divine navel; If such emperumAn bestows a benefit among the other goals/benefits in the best way to me, then, to whom will he give himself? Implies that emperumAn did not bestow other benefits [and bestowed himself] to AzhwAr due to not having an apt entity who can receive him, but due to his mercy. poruL … – If he bestows another superior benefit among the purushArthams (goals/benefits). pinnai yArkku avan thannaik kodukkum – Is there any one who can quickly accept him? karu mANikkam … – Would any one accept such neem juice [AzhwAr is sarcastically highlighting emperumAn as neem juice which is bitter]? karu mANikkak kunRaththu – [dark carbuncle hill] The example for emperumAn, who is the refuge. thAmarai pOl – [lotus flower] The example for his individual limb-wise beauty. 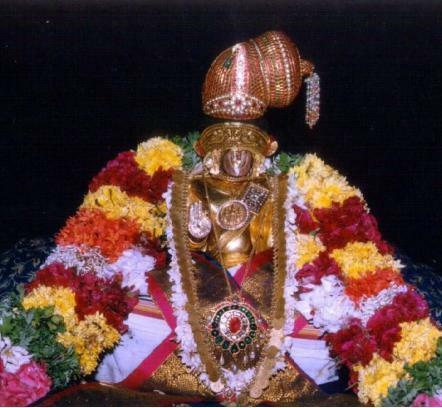 thiru mArvu – The divine chest where pirAtti, who is the purushakAram [one who presents the situation of AthmAs to emperumAn and recommends on their behalf], resides. kAl – The divine feet one will fall at, after being won over by the divine togetherness of emperumAn and pirAtti. kaN … – The eyes which shower their cool glance at those who fall at the feet, the eyes which will lift them up and embrace them, the lips which will speak sweet words and the divine navel which is enjoyable for them. Didn’t thiruppANAzhwAr say in amalanAdhipirAn 3 “undhi mEladhanRO” (my mind is fully dependent on your navel). This entry was posted in thiruvAimozhi, thiruvAimozhi 8th centum on April 17, 2019 by Sarathy Thothathri. In the fifth pAsuram, AzhwAr says “emperumAn mercifully stood inside me to make everyone praise me saying ‘what a benefit he has got’; for such emperumAn, I will not consider any glory other than the glory acquired by this act, as worthy”. poruLE – is it worthy? emperumAn is standing inside me as a shining ruby hill, revealing to me his radiant, divine mercy which is praised by the people of the world; is there any other glory such as praising him, worthy for me? thigazhum than thiruvaruL seydhu – Unlike limited mercy of others, he showered his [unlimited] mercy which brings glory to both him and me. ulagaththAr … – emperumAn showed how the people of world are praising the benefit I got. emperumAn is making the whole world to praise as said in thiruvAimozhi 1.5.11 “pAlEy thamizhar isaikArar paththar paravum Ayiram” (sweet milk like pAsurams which are celebrated by those who are well-versed in thamizh, those who are well-versed in music and can sing this and those devotees who understand the meaning). As said in SrI rAmAyaNam bAla kANdam 4.32 “imau munI pArthiva lakshaNAnvithau kuSeelavau chApi mahAthapasvinau …” (SrI rAma says – the narration by these saintly kuSa and lava, who are having kingly feature and are great hermits, is bringing good fortune to me; listent to this greatly virtuous legend), the whole world is praising. en uL … – Entering in me, considering to have attained the impossible benefit, remaining firmly without leaving and with great glow, stood like a shining ruby hill. pugazhum pugazh – Other than this great quality of standing in me, I will not consider any other glory as worthy. I will not even consider his elimination of my attachment towards my senses as something worthy [in comparison to being inside me]. This entry was posted in thiruvAimozhi, thiruvAimozhi 8th centum on April 16, 2019 by Sarathy Thothathri. In the fourth pAsuram, AzhwAr says “emperumAn, being with a form which cannot be easily seen even by the nithyasUris, being the apt lord who enslaved me as krishNa, the cowherd boy, will not bewilder me; there is no doubt that he entered in me and mercifully united with me”. My swAmy being obedient as one among the ignorant cowherd boys and having unbounded supremacy for the nithyasUris, unconditionally showered his distinguished mercy which is popularly known in this world, and placed his distinguished, pure, very radiantly glowing divine form inside my heart; he will not bewilder me by deceiving me with his amazing, deceitful acts. ennai vanjiththu mAya mayakku mayakkAn – emperumAn as krishNa, told the unfavourable ones such as dhuryOdhana et al “I won’t take up arms” but took to arms; turned day into night and deceived them; but did he do any such thing towards pANdavas? [No] Hence, he will not bewilder me who fully exists for him, through his amazing, deceitful acts. 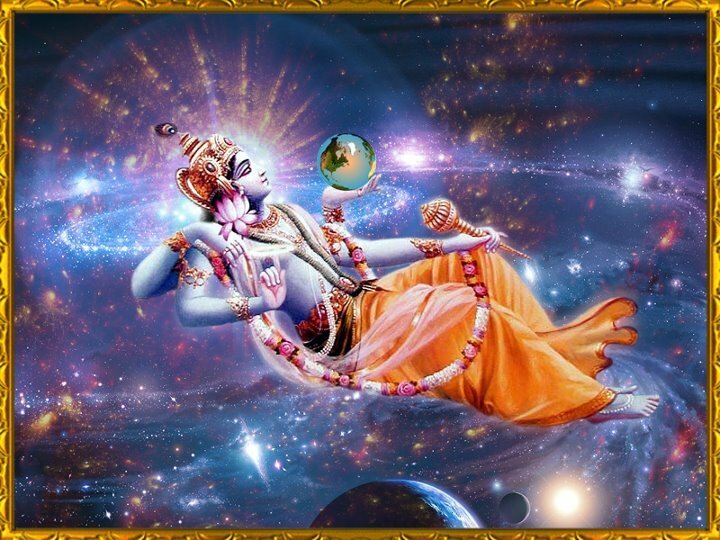 Ayan amararkku ari ERu enadhu ammAn – Though he is having supreme greatness over nithyasUris, he, my ultimate well-wisher, incarnated as krishNa and accepted my servitude; [hence] he will not bewilder me with his deceitful acts. thEsam thigazhum than thiruvaruL seydhu – thUya sudarch chOdhith thanadhu ennuL vaiththAn – He arrived inside me and showered his mercy, to be well known all over the world. 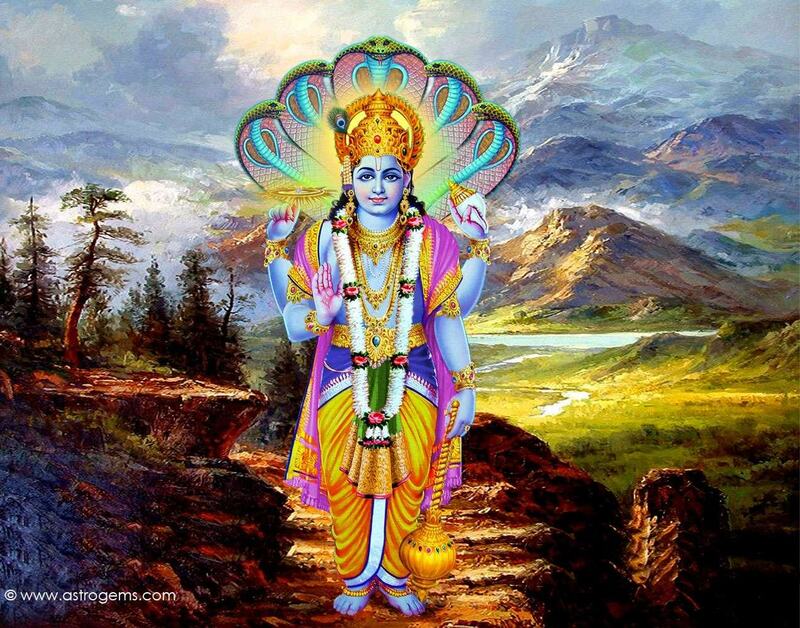 than thiruvaruL – The distinguished mercy which is seen only in him and no one else. He placed his distinguished divine form which is opposite to all defects, having great radiance and is in pure goodness state, inside me. He manifested his divine form which manifests that he is ananyasAdhya (not attained by the effort of anyone else) as said in muNdaka upanishath 3.2.3 “thasyaisha AthmA vivruNuthE thanUmsvAm” (bhagavAn shows his true form to those who are dear to him). This entry was posted in thiruvAimozhi, thiruvAimozhi 8th centum on April 15, 2019 by Sarathy Thothathri. In the second pAsuram, AzhwAr says “Even emperumAn’s elimination of the danger of gajEndhrAzhwAn is not a match for his great favour of accepting me by manifesting his beauty and eliminating my attachment towards my senses”. While the uncontrollable, distinguished five senses were ruling over my desirous heart, emperumAn entered my heart to make them wane and perish, and remained firm in there, watching me; [after seeing such favour] the favour of the lord who is greater than all, who showered his mercy for the elephant with huge feet, does not look like a favour. Implies “the favour you have done to me who was caught by the crocodile of five senses, is far greater”. irundhAn kaNdu koNdu – Just as an impoverished person finding treasure would keep watching it, emperumAn keeps watching me. SrI rAmAyaNam kishkindhA kANdam 5.18 “anyOnyam abhivIkshanthau na thrupthim upajagmathu:” (SrI rAma and sugrIva were gazing at each other without getting fully satisfied), AzhwAr is not seeing himself [as he is fully engrossed in emperumAn seeing him]. enadhu Ezhai nenju ALum – The senses tormented my heart which runs after everything it sees, due to that same reason. As my heart was not surrendered to a strong person, the senses started dominating it. thirundhAdha – They are so cruel that they cannot be reformed even by the omnipotent sarvESvara since time immemorial. Or aivarai – You cannot find another set of five entities like these. Due to the suffering inflicted by them, AzhwAr is highlighting his senses with respect. thEyndhaRa manni irundhAn – To diminish the attachment towards worldly matters which are visible to the eyes, he stood there presenting his beauty. Everyone becomes attached to worldly matters due to their beautiful forms only. As kings would kill their enemies with the strength of their seat/throne, emperumAn entered my heart thinking “we should win over them with our presence”. He is as said in thirumAlai 16 “pOdharE enRu sollip pundhiyil pugundhu than pAl Adharam peruga vaiththa azhagan” (Calling out “come here”, the beautiful emperumAn entered my heart and increased my attachment towards him). perum thAL … – sarvESvaran who showered his mercy on the elephant which had huge feet. The huge body indicates the unbearability of the pain. perumAn – thAn – tharum – aruL thAn – The mercy he granted. Since the mercy keeps flowing at all times [past, present and future], he says “tharum” (in present tense). As he thinks that whatever favours done by emperumAn to his devotees are done for himself, he speaks in this way. ini yAn aRiyEn – After he helped me, I don’t consider that [help to gajEndhrAzhwAn] as help. The elephant suffered for thousand years, the pond is limited in size and there is one crocodile; I have been suffering since time immemorial, caught in the samsArArNava (ocean of nescience) and there are five crocodiles [five senses]. Is the great quality of helping me only as good as helping gajEndhrAzhwAn? AzhwAr highlighted emperumAn’s help to SrI gajEndhrAzhwAn and highlighted how that is greater than his help for others; and then, he highlights the help to AzhwAr himself and highlighted how that is greater than his help to gajEndhrAzhwAn. This entry was posted in thiruvAimozhi, thiruvAimozhi 8th centum on April 13, 2019 by Sarathy Thothathri. In the first pAsuram, AzhwAr mercifully mentions in brief as to how emperumAn came and united with him. Subsequently, AzhwAr says “To eliminate all my suffering as I called out as a seeker, he entered my heart as a seeker and resided there as some one who attained a great benefit”. emperumAn being astonished at me who was calling out every day for a long time seeking him saying “he will place me at his perfectly enjoyable divine feet”, entered my heart as loving vAmana to remain firmly, manifesting his distinction, and resided there, fully seeing me. 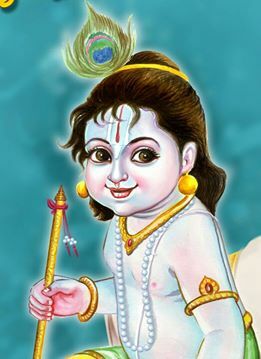 ennaith than pon adik kIzh – viyandhu – iruththum enRu – emperumAn would place me who was interested in worldly pleasures without knowing his greatness, at his glorious divine feet, feeling astonished thinking “in this samsAra (material world) which has been given up by me as said in SrI bhagavath gIthA 7.19 ‘sa mahAthmA sa dhurlabha:’ (Such large-hearted souls are rare to attain), there is someone who is desiring me” and make me inseparable and engage me in service. With this, prApya (goal) and prApaka (means) are explained. The nature of prApyam is explained by “than pon adik kIzh” (emperumAn’s enjoyable divine feet); by saying “iruththum” (he will place), it is explained that emperumAn himself is the means. viyandhu iruththum – Would place me there as a benefit for him. 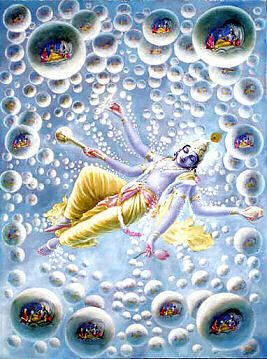 aruththiththu – To be a chEthana entity (sentient) one should at least have this [seeking to reach him]. enaiththu Or pala nAL – AzhwAr is stating what he said in thiruvAimozhi 8.5.8 “nAL nALum” (everyday). azhatiththERku – AzhwAr is stating what he said in thiruvAimozhi 8.5.6 “ennai ALak kUppittazhaiththakkAl” (When I call out for you to enslave me). piLLAn explains – AzhwAr is saying “Without knowing his great love, I considered him to be delaying and I am having great desire towards him, and called out for him”. When we think about his love, starting with our seeking, everything seems superfluous; it is said in thiruvAimozhi 9.3.9 “ezhudhum ennum idhu migai” (worshipping him and rising are also superfluous). poruththam udai – I said in thiruvAimozhi 8.5.8 “idhuvO poruththam” (is this matching?) towards the one who has such matching love. vAmanan – What have I done seeking from him? He was the one who became a seeker himself to regain his own belonging. thAn pugundhu – To get me, he entered my heart as a seeker. 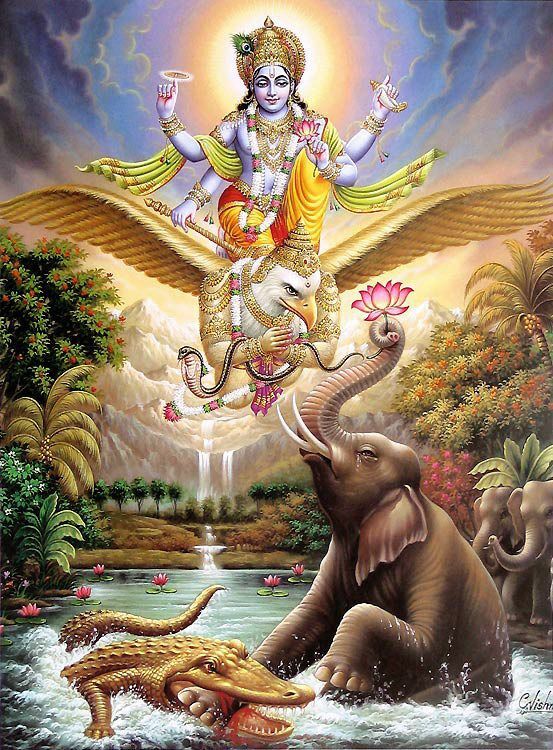 en than karuththai uRa – He accepted my thoughts as I said in thiruvAimozhi 2.9.4 “thanakkEyAga enaik koLLum IdhE” (he should accept me for his own sake). vIRRirundhAn – emperumAn manifested the distinction in his physical form after having attained AzhwAr and remained as krutha kruthya (one who completed the task that has to be completed). kaNdu koNdE – Just as parents would lovingly keep seeing their child who survived a great disease, emperumAn is seeing AzhwAr as he escaped the suffering he went through in thiruvAimozhi 8.5 “mAyak kUththA“. This entry was posted in thiruvAimozhi, thiruvAimozhi 8th centum on April 12, 2019 by Sarathy Thothathri. 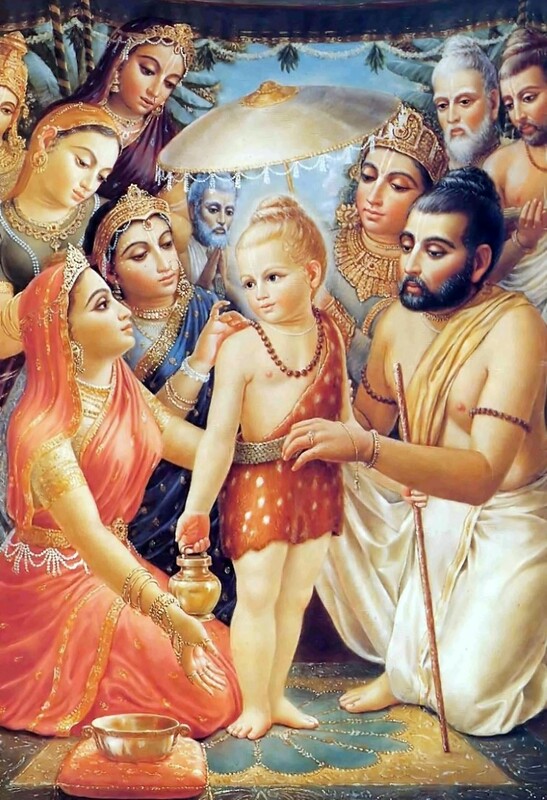 As said in SrI rAmAyaNam yudhdha kANdam 19.1 “rAghavENAbhayE dhaththE sannathOrAvaNAnuja:” (as SrI rAma gave his protection, rAvaNa’s brother vibhIshaNa worshipped him), SrI vibhIshaNAzhwAn who was wondering “Will I, who am born as younger brother of rAvaNa, become a servant of the descendants of raghu vamSam?” when heard about the invitation of perumAL (SrI rAma) to come in, felt “Is SrI rAma mercifully accepting me! What happened to the inferior nature of being born as the younger brother of rAvaNa?” and fell at the divine feet of SrI rAma like an uprooted tree, along with the four rAkshasas who accompanied him and became very grateful to perumAL. thiruvadi (hanuman) entered aSOka vanam where SrI rAma’s qualities were not discussed/enjoyed, and performed rAma nAma sankIrthanam to sustain sIthAp pirAtti as said in SrI rAmAyaNam sundhara kANdam 31.1 “samSravE madhuram vAkhyam” (words that are sweet to hear), pirAtti thought “This is not heard in this place; is this caused by bewilderment? Is this caused by the wind? Is this the hallucination which occurs for those who are in separation? Or is it a mirage?” and doubted in many ways as said in SrI rAmAyaNam sundhara kANdam 34.23 “kinnusyAth chiththa mOhOyam bhavAth vAtha gathithviyam | unmAdhajO vikArOvA syAdhiyam mrugathrushNikA ||“; SrI janakarAja’s divine daughter then acquired clarity thinking “he is speaking to me standing in front of me; hearing this, we are also acquiring emotions; hence, this must be true”. Similar to these incidents, AzhwAr too doubted thinking “this must be my hallucination or dream” and then acquired clarity realising “no it is not hallucination or dream; it is the truth” and became pleased thinking “emperumAn caused adhvEsham (not having hatred), created Abhimukhyam (being favourable) in me, and made me unable to sustain without him and is mingling with me freely ignoring his own supremacy! What an obedience towards his devotees! What a simplicity!” and becomes blissful meditating upon his qualities. This entry was posted in thiruvAimozhi, thiruvAimozhi 8th centum on April 11, 2019 by Sarathy Thothathri. In the end, AzhwAr says “This decad, by itself, will carry those who learn it, to paramapadham”. iruththum – will make them stay put. This decad among the thousand pAsurams which resemble a mixture of milk and nectar, composed by the words of nammAzhwAr, the leader of the fortified AzhwArthirunagari, to surrender unto Sriya:pathi who is eternally residing in thirukkadiththAnam which is having gardens, will make those who have connection with this decad to stay put, being pleased, in the high abode of paramapadham. sOlai … – Sriya:pathi who is eternally residing in thirukkadiththAnam which is having invigorating, attractive gardens. madhiL kurugUr – AzhwArthirunagari which is surrounded by fort which stops the sorrows of this samsAram from entering inside. 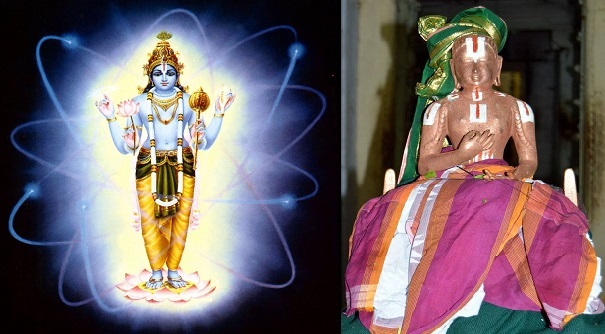 satakOpan sol – As said in SrI rAmAyaNam bAla kANdam “raghuvara charitham muni praNItham” (History of SrI rAghava (SrI rAma) spoken by the sage vAlmIkI bhagavAn [who only speaks about SrI rAma]). The thousand pAsurams which resemble a mixture of milk and nectar; or this decad which resemble a mixture of milk and nectar. This indicates the proper match between the words and the meanings. ALavandhAr‘s explanation – pAl (milk) indicates thirumAl (SrIman nArAyaNa) who resides in thirukkadiththAnam. amudhu (nectar) indicates nammAzhwAr‘s words. ippaththum viyandhu mElai vaigundhaththu iruththum – This decad would think “It is amazing that in this samsAram (materialistic world) there is someone who recites this decad” and will place that person in the supreme abode, SrIvaikuNtam. It will place such person in the supreme abode where one need not go through the suffering as in previous decad “mAyakkUththA” and will grant eternal experience to such person. This entry was posted in thiruvAimozhi, thiruvAimozhi 8th centum on April 10, 2019 by Sarathy Thothathri.